With a unified approach and a belief that creating a safe working environment is critical to success, Iconic Mechanical's extensive experience in estimating keeps your plan and spec project on-time and on-budget. Our expertise in the systems we install allows us to keep your costs low and system performance high. Rising 16 stories above the heart of SOHO, 10 Sullivan stands as the neighborhood’s tallest residential building, and offers residents an unparalleled variety of luxury home and apartment options. The Terminal Warehouse contains over one million square feet of rentable space and it occupies the entire block bounded by Eleventh Avenue, Twelfth Avenue (the West Side Highway), West 28th Street, and West 27th Street in the Chelsea and Hudson Yards areas of Manhattan. The building ranges in height from seven to nine stories and contains one basement level. The most modern building in the Gramercy Park/Irving Place neighborhood and one of the most interesting new buildings in the city, 57 Irving Place is an 11-story residential condominium with 9 apartments. Located at 360 Furman Street, One Brooklyn Bridge Park offers residents spectacular views of Lower Manhattan, world-class amenities and spacious units. The Masters School, an independent coed day and boarding school for grades 5 -12, has opened the Maureen Fonseca Athletics and Arts Center. Designed by Peter Gisolfi Associates and built by Shawmut Design and Construction, this vibrant new center was designed to reflect and elevate the school’s distinctive teaching methodology, encouraging diverse opinions and shared experiences. 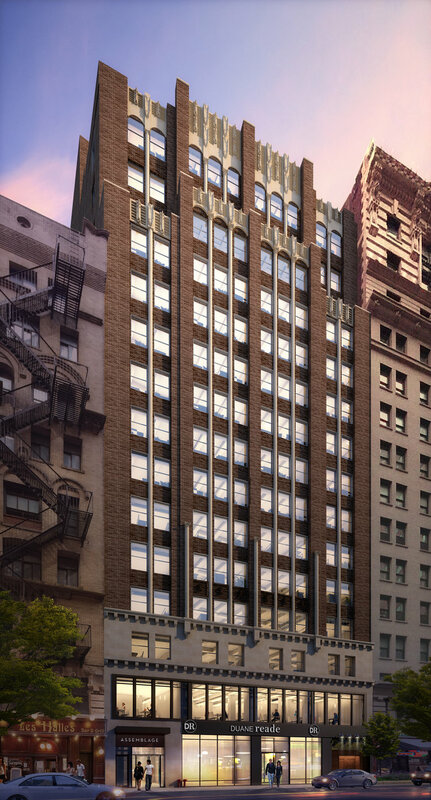 An existing 12-story building located at 114 East 25th Street in the budding NoMad district of Manhattan which Shorewood will develop in 2016 at a projected cost of $80 million. The property will be built out as collaborative workspace operated by Assemblage. Assemblage will also offer a rooftop deck with exceptional views of the Manhattan skyline; a perfect outdoor space for events and special occasions. The project is being designed by the globally recognized design boutique, Meyer Davis, which specializes in residential, hospitality, retail, and workplace environments around the world. An existing 15-story building located at 17 John Street, in Manhattan’s evolving Financial District. The venue is situated a block away from the new World Trade Center and directly next to Fulton Center, the third largest transit hub in New York City. The building was acquired by a joint venture consisting of Shorewood, Prodigy Network, and Metro Loft in August 2014. The total project cost is estimated at $170 million. To date Shorewood secured $76 million of senior and subordinate debt for the acquisition and pre-development of the project. Upon completion the building will have 18 stories, totaling 140,000 square feet. The base of the building will be gut renovated and 3 stories will be added to the top. The completed property will combine 50,000 square feet of collaborative workspace with 106 furnished residences that will be leased on a short term basis. The project is being designed by the globally recognized design boutique, Meyer Davis, which specializes in residential, hospitality, retail, and workplace environments around the world. The Zazen Bear Flagship store, located in Soho, NYC, is a Korean-Japanese multi-use concept shop that serves as a retail space, art gallery, and meditation center. Within a space designed to encourage peace, tranquility and harmony, Zazen features products, including jewelry, housewares and Zen spirited items; wellness programming, including yoga and meditation classes; and an art gallery, presently exhibiting painting and calligraphy work by the Japanese artist, Seiho.